The devotees, from the country as well as abroad, donated Rs 8.05 crore in donation boxes kept in the temple premises between December 22, 2018 and January 1, 2019. Nearly 9.5 lakh devotees from different parts of the country and abroad visited the Saibaba temple. The devotees, from the country as well as abroad, donated Rs 8.05 crore in donation boxes kept in the temple premises between December 22, 2018 and January 1, 2019, Shri Saibaba Sansthan Trust's vice chairman Chandrashekhar Kadam told reporters on Wednesday. The temple trust also received Rs 6 crore through online donations, debit/credit cards, cheques, demand drafts and at its donation counters, he said. Gold and silver items worth Rs 19 lakh were also donated, he said. In addition to this, devotees from 19 countries, including USA, the UK, Malaysia, Singapore, Japan and China, donated foreign currencies worth Rs 30.63 lakh. Apart from these donations, the temple trust earned Rs 3.62 crore through paid passes issued to visitors and the online darshan facility provided by the temple management, Mr Kadam said. 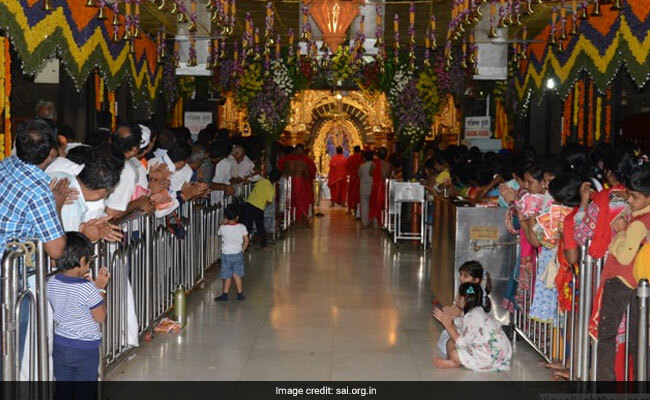 Nearly 9.5 lakh devotees from different parts of the country and abroad visited the Saibaba temple, located at Shirdi town in Ahmednagar district, during the 11-day period, he added.